Baarzo describes its product as “true video search,” allowing users find specific moments in a video, like a slam dunk in a basketball clip. If it delivers on that promise (I can’t say one way or another, since the company is not accepting signups), that would be pretty appealing to Google, both for search in YouTube and for the company’s efforts to offer “universal” search across media types. Apparently Google Executive Chairman (and former CEO) Eric Schmidt was impressed by a demonstration of the technology at Stanford’s Graduate School of Business, where co-founder and CTO Siva Yellamraju just got his MBA. 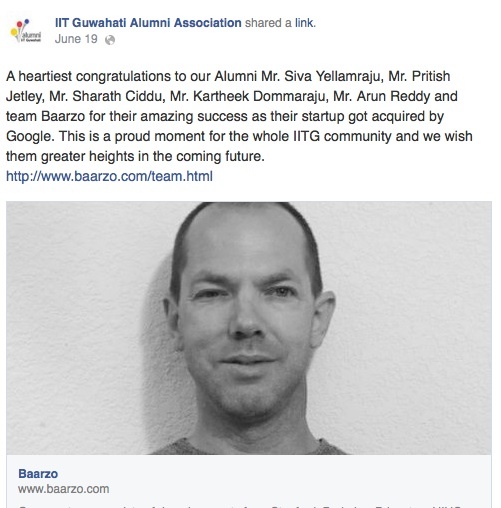 Someone tipped me off about the possible deal when people started posting on Facebook that Google had acquired Baarzo. Some of those posts were private, but at least one (screenshot below) was public. The startup has not announced any funding, but its AngelList profile says that it was part of StartX, the accelerator for the Stanford community, and that investors include Ullas Naik of Streamlined Ventures and Matt Sonsini of Sobrato Capital.